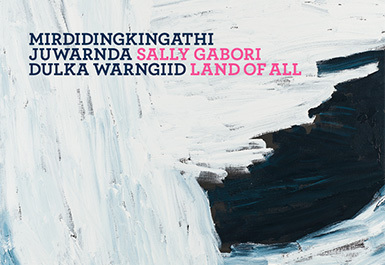 This retrospective of the work of the late Mirdidingkingathi Juwarnda Sally Gabori celebrates the life of the senior Kaiadilt artist from Bentinck Island in Queensland's Gulf of Carpentaria. 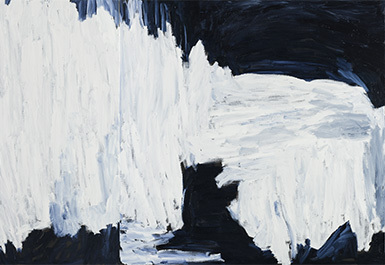 The exhibition includes the artist's early paintings, her large collaborative works with other Kaiadilt women, and her almost monochromatic recent paintings and works on paper. Sally Gabori's depictions of her homeland are abstract in nature, but retain representational elements which map traditional country and cultural identity in monumental paintings. 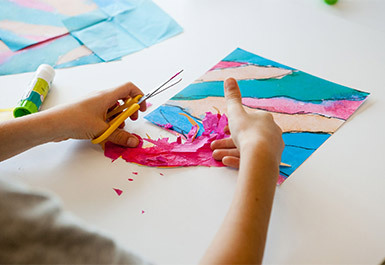 The exhibition will travel to the National Gallery of Victoria from 23 September 2016 until 29 January 2017. Birmuyingathi Maali Netta Loogatha, Mirdidingkingathi Juwarnda Sally Gabori, Warthadangathi Bijarrba Ethel Thomas, Thunduyingathi Bijarrb May Moodoonuthi, Kuruwarriyingathi Bijarrb Paula Paul, Wirrngajingathi Bijarrb Dawn Naranatjil, Rayarriwarrtharrbayingat Amy Loogatha / Makarrki – King Alfred’s Country 2008 / Purchased 2009 with funds from Professor John Hay, AC, and Barbara Hay through the Queensland Art Gallery Foundation / Collection: Queensland Art Gallery / Courtesy: Mornington Island Arts and Crafts / © The artist. Mirdidingkingathi Juwarnda Sally Gabori, Kaiadilt people, Australia 1924-2015 / Dibirdibi Country 2008 / Synthetic polymer paint on linen / Purchased 2008 with funds from Margaret Mittelheuser, AM, and Cathryn Mittelheuser, AM, through the Queensland Art Gallery Foundation / Collection: Queensland Art Gallery / © Mirdidingkingathi Juwarnda Sally Gabori 2008/ Licensed by Viscopy, 2016 . Birmuyingathi Maali Netta Loogatha, Mirdidingkingathi Juwarnda Sally Gabori, Warthadangathi Bijarrba, Ethel Thomas, Thunduyingathi Bijarrb May Moodoonuthi, Kuruwarriyingathi Bijarrb Paula Paul, Wirrngajingathi Bijarrb Kurdalalngk Dawn Naranatjil, Rayarriwarrtharrbayingathi Mingungurra Amy Loogatha / Dulka Warngiid 2007 / Purchased with funds donated by Catherine Allen, Carolyn Berger and Delma Valmorbida, 2007 / Collection: National Gallery of Victoria / © The artists 2007. Licensed by Viscopy 2016. Mirdidingkingathi Juwarnda Sally Gabori, Kaiadilt people, Australia 1924-2015 / Ninjilki 2008 / Synthetic polymer paint on canvas / Purchased with funds donated by Colin Golvan, 2008 / Collection: National Gallery of Victoria, Melbourne / © Mirdidingkingathi Juwarnda Sally Gabori 2008/ Licensed by Viscopy, 2016.